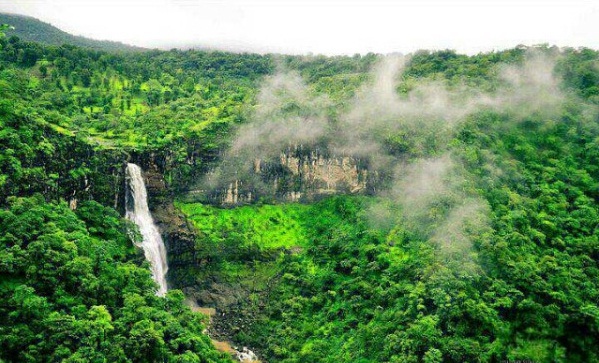 Dugarwadi waterfall is one of the best natural waterfalls of Maharashtra. This impressive waterfall is only 30kms away from the wine city Nasik and 2km off the Jawahar Road. Very few people visit to Dugarwadi, that’s why it is very clean and unexplored. It is a great place to visit, especially in monsoon when you can enjoy pristine surroundings and lush greenery everywhere. The mountains near Trimbak Road, many times covered with clouds and fog are sure to mesmerize you with their serenity. The fresh air, water streams and dense forest are all seductive at Dugarwadi. 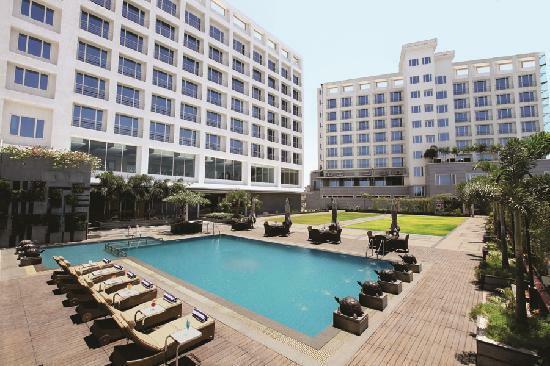 The waterfalls will make you forget about all the stress, tension and hustle-bustle of concrete city life. The nature lovers and adventurous people prefer to take a complete day outing at Dugarwadi to experience the lively spirit of monsoon season. The waterfall view is breathtaking and spectacular for those who want to feel water beauty of Nasik. After reaching the place, you have to park vehicles near the road and a walk of 1-2 km is needed to reach at the exact place of waterfall. If you follow the river way then you will pass through the hills which will sure to offer you great scenery. While doing adventurous trek during monsoon, be careful as the water level may rise suddenly and you might get trapped into rushing waters. It is recommended to make group visit at Dugarwadi, because there is no security available and it is also a lonely place. Vipashyana International Academy is located at Igatpuri. It was established in 1976 The aim was to conduct Vipassana Courses for those in search of peace of mind and harmony. 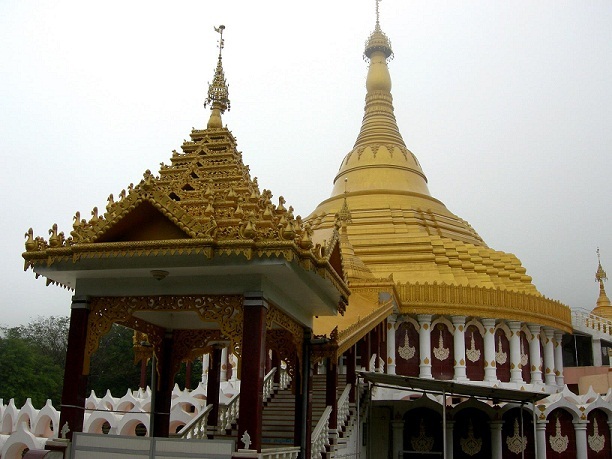 Known as Dhammagiri, it is located in Igatpuri, 40 kms away from Nashik City, on Bombay-Agra road.This world famous meditation centre offers techniques which relieve mental stress and promote inner peace. It is turning the wheel of time conversion from Kalchakra to Dharmachakra under the able guidance of Guruji Satyanarayan Goenka. A 10 day residential course at the centre, which is free of charge, ends with Bhavatu Saba Mangalam meaning May all beings be happy. Ambad, Nashik – 422 010. Maharashtra, India. Fax : +91 253 2384300. The scenic Navashya Ganapati temple is dedicated to Lord Ganapati/Vinayak. 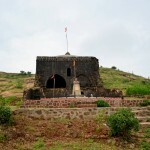 It is located at 6km from the CBS, on the way to Someshwar or Gangapur dam in Nashik. The temple is just next to the river Godavari and is a ‘Jagrut Devasthan’. It is fondly called as Navashya ganapati since the Ganapati here answers to the offerings in prayers (navas) of his devotees. The Navashya Ganapati temple is believed to be built around 300-400 years ago by the Peshwas. 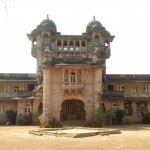 Raghoba Peshava and his wife Anandibai have built it in the year 1774. The Navashya Ganapati idol is saffron in color and its eyes are very lively. 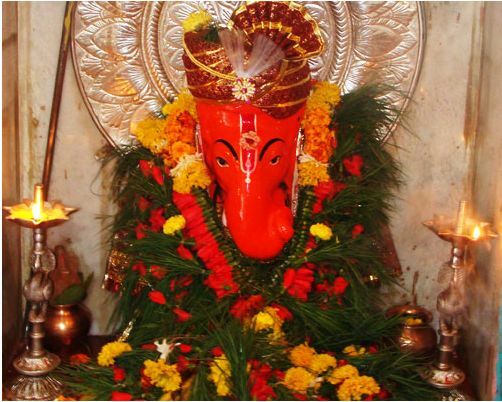 The temple also has replica idols of all the Ashtavinayaka.